What to do when a recipe calls for a specific kind of alcohol and you don't happen to have that particular ingredient? Cooking with alcohol can be tricky, and not everyone wants it as an ingredient; if you're going to be serving the dish to children or to someone who doesn't drink alcoholic beverages, it's not always appropriate. This guide will help you substitute different alcoholic ingredients with non-alcoholic ones. Almost all of the time you can find a good alternative ingredient to serve as a substitute for alcohol. Just be aware of which substitution works best for a given kind of alcohol. Here are some suggestions for what to use in your recipe when you're out of booze or just don't want to include it. Your end results will differ slightly from the original recipe, but that's not necessarily a bad thing. This is an easy one. Instead of this almond-flavored liqueur, you can simply use almond extract. For light beers, substitute chicken broth, ginger ale or white grape juice. For heavier beers, use a stronger beef, chicken or mushroom broth or stock. Non-alcoholic beers may also be substituted. This liquor is made of distilled wine or fruit juice, so you can substitute apple juice or another flavor of fruit juice depending on the recipe. You may also want to use a flavored extract (vanilla, lemon, etc) if the recipe only calls for a small amount. This is a type of apple brandy, so you can just use apple juice concentrate or juice. For this sumptuous black raspberry liqueur, you can substitute raspberry juice, syrup or extract for similar results. Sparkling white grape juice or ginger ale are fine non-alcoholic alternatives. Non-alcoholic wine, diluted currant or grape juice, cherry cider syrup will work fine. This aged, double-distilled wine (or fermented fruit juice) can be replaced with peach, apricot or pear juice. You can substitute frozen orange juice concentrate or regular orange juice for this French, orange-flavored liqueur. If you use orange juice, first reduce (boil) it to give it a thicker consistency before adding to your recipe. Liqueur made from bitter Seville oranges is another ingredient that can be replaced with frozen orange juice concentrate or reduced fresh orange juice. This thick and syrupy, sweetened mint liqueur, comes in both clear and green varieties. If your recipe needs the green color, just add a drop of green food coloring. You can use spearmint extract or oil mixed with a little water or grapefruit juice to approximate the flavor. This is a French raspberry liqueur can be substituted with raspberry juice or syrup or even seedless raspberry jam, depending on the recipe. Italian hazelnut liqueur which can be replaced with hazelnut or almond extract. This golden Italian anise liqueur has a very specific taste, but can be substituted with either anise or licorice extract. Another orange-flavored French liqueur which is easily substituted with frozen orange juice concentrate or reduced fresh orange juice. This is a very sweet Italian grape brandy, so you can use either grape juice or reduced non-alcoholic red wine in its place. The main ingredient in a Shirley Temple (the beloved kids' drink) comes in alcoholic and non-alcoholic varieties, so this is an easy fix. Fermented, alcoholic cider can be swapped for apple cider or apple juice. This sweet, syrupy Mexican liqueur made with coffee and cocoa beans can be substituted with strong coffee or espresso combined with a touch of cocoa powder. Colorless liqueur made of cherries is easily replaced with any of the following juices: black cherry, raspberry, boysenberry, currant, or grape, or any of the corresponding flavors of syrup, depending on how thick you want your recipe. Dry French wine which can be substituted with a non-alcoholic variety, grape juice or red wine vinegar, depending on how sweet the recipe needs to be. 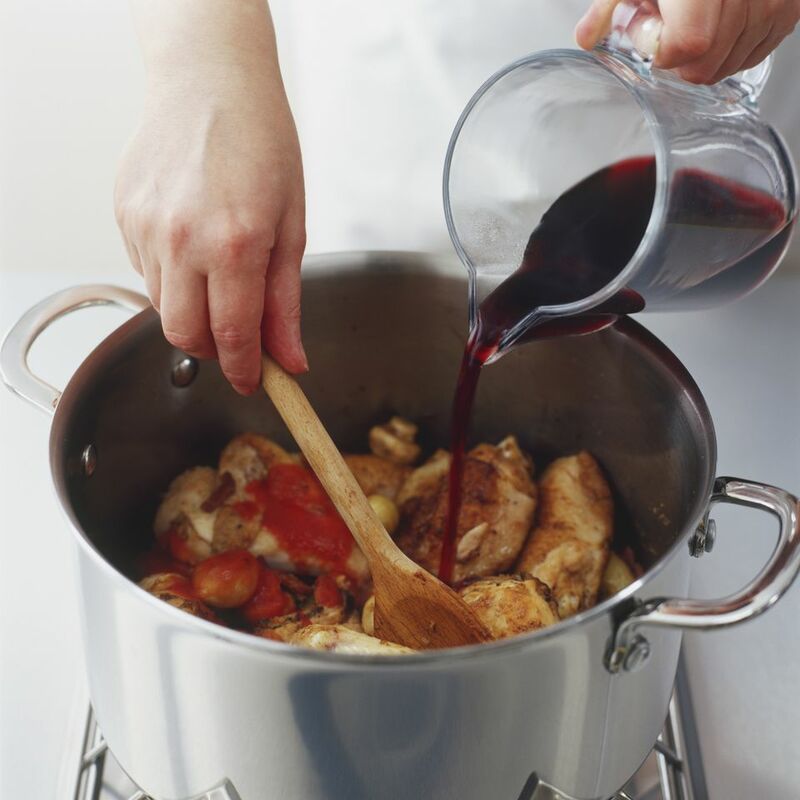 There are a lot of possible options for replacing red wine in a recipe (most often a sauce or soup). Non-alcoholic wine, beef or chicken broth or stock, diluted red wine vinegar, red grape juice diluted with red wine vinegar or rice vinegar, tomato juice, and liquid from canned mushrooms are all possibilities. It's one of the most-used cooking liquors. When you break it down, rum is just liquor distilled from molasses or sugar syrup. So for light rum, use pineapple juice flavored with almond extract. For dark rum, use molasses thinned with pineapple juice and flavored with almond extract. You could also try rum extract flavoring, but it's likely to have some alcohol content. This Asian fermented rice drink can be swapped for rice vinegar, but be careful of the consistency. Vinegar will obviously be a bit more pungent, so don't expect to use an equivalent amount. Flavored, colorless liquor which can be replaced with the corresponding flavored extract such as peppermint, peach, and so on. Known as a dessert wine, sherry can be swapped for orange or pineapple juice in most recipes. Most chefs are unlikely to have cactus juice, but agave nectar, which is another acceptable substitute for tequila (since they're made from the same plant) is available in most grocery stores. Another orange-flavored liqueur which can be replaced with orange juice frozen concentrate or reduced fresh orange juice. The key ingredient in a proper martini, vermouth is a wine-based drink infused with herbs, which may be sweet or dry. If your recipe calls for sweet vermouth, use non-alcoholic sweet wine, apple or grape juice or aged balsamic vinegar. For dry vermouth, use non-alcoholic white wine, white grape juice or white wine vinegar. This may be the one alcohol that can't easily be substituted with a nonalcoholic alternative. If the recipe calls for a small amount, it may be omitted altogether. Like its red cousin, there are plenty of replacements for white wine. Try non-alcoholic wine, chicken broth or stock, diluted white wine vinegar or cider vinegar, white grape juice diluted with white wine vinegar, ginger ale, canned mushroom liquid, or water. For marinades, substitute 1/4 cup vinegar plus 1 tablespoon sugar plus 1/4 cup water.